Spring is almost here and love is in the air. 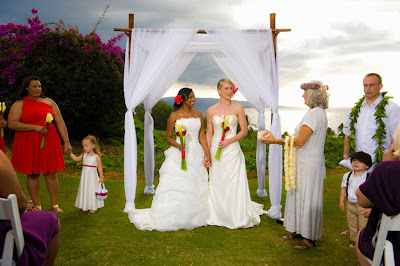 Kira and Katy held their Civil Union on a lawn in Makena overlooking the Pacific Ocean with 20 of their closest friends and family. The Reverend Diana George officiated the ceremony with soulfulness for this beautiful couple while our good friend and current touring member of HAPA, Tarvin Makia, serenaded us all with his sweet renditions of contemporary Hawaiian music and original compositions. 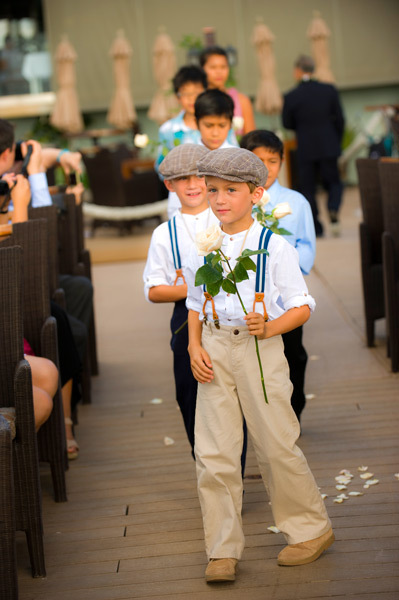 On a warm afternoon in Maui with a gentle breeze blowing, live music is the perfect accompaniment for your civil union or Maui Wedding Ceremony. On the bluff overlooking Kapalua Bay on the beautiful island of Maui is a fabulous ocean view restaurant which is perfect for your Maui Wedding Day. Venny and Erik bought out the deck and staged a gorgeous wedding ceremony on a high blue Sunday with about 50 of their closest friends and relatives. Marry Me Maui was there to coordinate this event with live music and one of our Hawaiian officiants. The Maui wedding photography was of course provided by our in-house photographer Joe D'Alessandro and the food was wonderful. We always get questions from our clients as to whether to do a beach wedding or to rent a venue. We usually suggest a semi private venue for 25 or more people. This way, you can have chairs and arches, which are not allowed on public beaches, and your guests don't have to worry about parking and people laying on the beach. Semi Private venues, like the one Venny and Erik used, are reasonably priced and the views and service are spectacular.